Hoping to see a lot more effort from the lads today! Will be interesting to see what team turns up. Nice one @DocStone back to today's business. Let's put Killie to the sword this afternoon. I’m desperate to see Glenn Middleton get some minutes in the first team tbh, hope he’s on the bench. Watched all of our youth highlights on RTV yesterday and he looks totally immense, Rossiter has looked very good also. 3-1,to the Glasgow Rangers,overdue a performance,but will take an “ugly “win,points are more important. We will win but concede a couple imo. Time too see who is up to standard and who isn’t. Christ with everything that’s went on I nearly forgot we have a game. Hopefully yesterday’s appointment will inspire a comfortable victory! 3 points please Rangers, let's focus on the job. Are Alves and Bates fit and available? Giving a preferred team line up depends on whether they are. I think we'll labour to a 3-1 win today. Probably get to 2-1 and then eventually close it out late on. Is Candeias suspended for today? Not sure about Alves but (according to another thread) Bates is available again. Let's keep this new feel good factor going today Rangers. Remember this mob shipped 5 goals last week too , so let's start the game well. I've got an athletics race at Grangemouth at lunchtime and then bombing back to try and make kick off. Please make it worth my while Gers. I don't give a hoot re team selection. 3 nil the good guys. I fancy an attacking 3-4-1-2 today, based on who is available. Time to be aggressive and forward thinking, goals win games. As Gerrard said yesterday, ‘it’s about winning football matches’. Three points essential Rangers, any way, any how. I’d have liked to have seen Gerrard pop into Auchenhowie yesterday and have a word with them. Missed opportunity IMHO. Everyone with big smiles(inc you huffalo) and a comfortable 3-0 win. Plz. Good win needed today to get some confidence back in our team. If the players are not up for it today after yesterday’s good feel factor at Ibrox with Stevie G and players now playing for there future then they need hounded out of Ibrox. You owe the fans and the Club a big performance. 3-0 will do just fine, anything better will be a bonus. Yeah hopefully we will be in for a surprise. I’ve no idea how Jimmy Nichol will set us up. But it better not be 4 funking 2 -3-1. And hopefully we will see changes at Centre half. I’m sure you catch my drift as I don’t want a ban for criticising certain individuals. Any win would suit me, if our current players can't get motivated and put in a much improved performance after the new manager announcement,then they need to look at their chosen profession and wether or not they should even be playing the game. Let's see if we get a positive reaction from players who have on many occasions this season hid from their responsibilities. Going for a 3-1 win for the Sons of William. C'MON THE RANGERS! ! ! ! ! ! Is the match a sell out today? Watch they will turn into R Madrid today cause Stevie Ger"s in the stand! If John's out I would play Rossiter @ LB with Docherty and Goss in the middle. Been said already I'm a big fan also of young Middleton and would like him involved at some point. 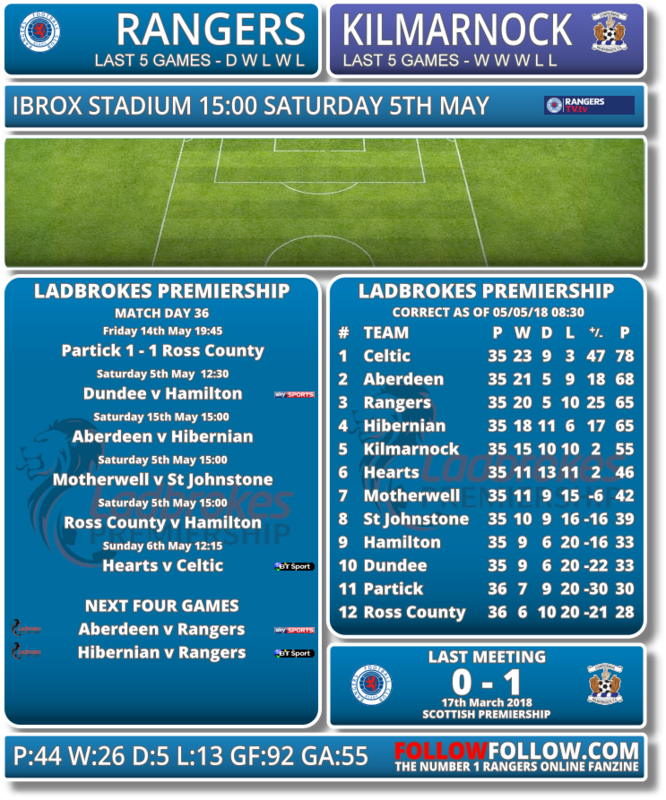 Think fibs and Rangers will win today, interesting last 2 games then!! Not sure if our new manager will be in attendance today,or if he has commitments with Liverpool, but, several of the players could be playing for their Rangers career. Good luck to Jimmy Nicholl, just get us the win please. Hope they play 2 up with Cummings and Morelos. Any win will do me and hibs and aberdeen game to get abandoned due to a meteor to hit the park. The players should be buzzing. Hope we go for it today. Any win will do us,get two up front. Sorry to say but I think the confidence in our guys has gone...draw at best. It's depressing how often we have said that this season only for the players to let us down. Kings interview sais he won't attend matches before 1st June. I expect to see 4-2-3-1 binned today. 4-4-2 for me when they have possession and close to a 2-6-2 when we have the ball. Just get the 3 points.